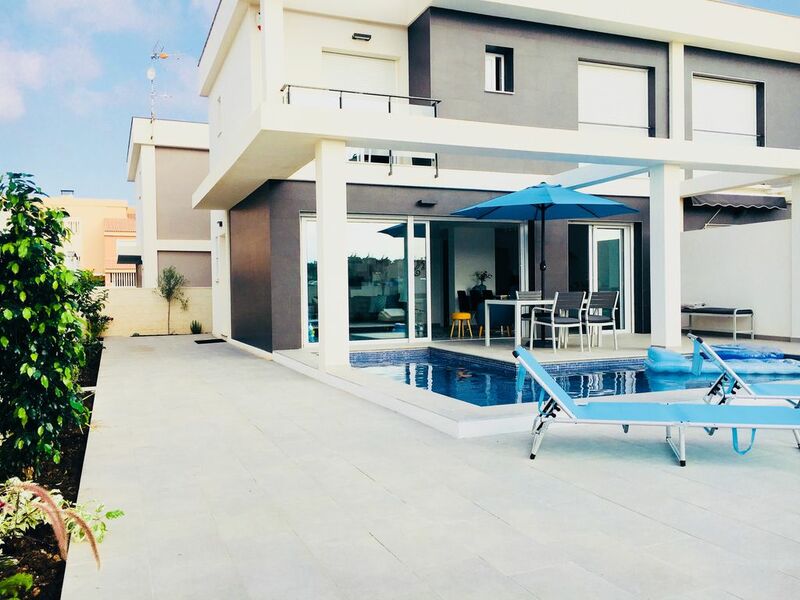 Casa Sirocco is a brand new, contemporary Villa located just south of Alicante on the Costa Blanca. With 3 bedrooms sleeping 5 guests, large open plan living area, a private plunge pool and private walled garden, it is ideal for a stylish getaway. Located just 10 mins from Alicante airport and a 5 min drive to the beautiful beach, with shops, restaurants and bars all within easy walking distance. This isn't your typical Spanish Villa. Stylish, contemporary, furnished to a very high standard and located just minutes from the Airport, this is the ideal retreat for a weekend escape or a long summer holiday. Casa Sirocco has everything you need including a fully fitted kitchen, 3 bathrooms, 3 walk in showers, an outdoor solar heated shower, a deep plunge pool, sun terrace, garden, floor to ceiling windows and stylish contemporary furniture. We have luxury mattresses with memory foam toppers and comfortable pillows on the beds. Need to be connected? Don't worry, we have satellite TV with free Netflix, free Fibre Optic WiFi and a bluetooth speaker to stream your music to. The house is fully fitted with air conditioning/heating to all bedrooms and the living/dining/kitchen, to ensure you can find a comfortable temperature whenever you visit. There are remote control ceiling fans installed in all 3 bedrooms and the house is designed to allow air to circulate. We appreciate that check in & check out times can often make it difficult to find flights that work for you. Where we can we are happy to arrange a later check out or earlier check in. We try to be as flexible as possible, just ask us before booking if you wish to take advantage of flexi times as it does depend on the house being available. The standard check out time is 11am. The standard check in time is 4pm. There is an extra charge of €20 levied by our key holder for check out before 8am or after 8pm. This is will be taken from your security deposit if you need to arrive or leave out of hours. 1 single room, 1 double room and a master double bedroom with en suite bathroom and balcony. All bedrooms have fitted wardrobes and lots of clothes hangers. A hairdryer is also available. Bath towels, beach towels & bed linen are all provided and the house will be cleaned and prepared for your arrival. 1) Most villas charge a cleaning fee on departure. For 2019 we are including this in the total price shown, so that you do not need to worry about this cost. 2) Electricity in Spain is very expensive so we do have to charge a nominal fee for usage. This is 0.20 kwh. A meter reading will be taken at the point of arrival and departure and the electricity cost will be taken from your security deposit. A usual fee is around €7 to €12 per week but of course this depends on your personal usage. We are two professionals based predominantly in the United Kingdom. Casa Sirocco is our home in Spain. We invite you to exclusive use of our Casa when we are not using it ourselves. Carabassi Beach is an award winning Blue Flag beach, with miles and miles of golden sands edged by dunes and pine woods. A designated nature area, with specially constructed boardwalks to carry you across the dunes to the beach where you will find beach bars (Chiringuitos), Lifeguards, Sunbeds and Parasols. There is also a Watersports area and for that 'all over' tan, a dedicated naturist zone. The beach isn't just for the daytime though, why not come down at sunset where the beach bars play chilled music whilst you sip a cocktail or visit the "Life" Beach Club to party on the sand after dark in the summer months. If this all sounds too much don't worry, the beach is 6 miles long with many areas deserted, so finding a quiet spot to sit and read is easy. Built upon and around a natural peninsula stretching into the Mediterranean, the resort of Gran Alacant is a hidden gem. An area popular with Northern Europeans, it is highly regarded as one of the best beachside locations on the Costa Blanca. Having slowly developed over a number of years, the resort was originally designed to be a seaside retreat for second home owners and consists of a number of small urbanisations each with their own architectural style. Homeowners today consist of Spaniards from places inland such as Madrid, Norwegians, Swedes, French, Russians and British. This gives the area a truly international feel with a friendly, laid back atmosphere. Many people live here all year round so there is always something to do. There are no hotels in the resort so prices aren't inflated for package tourists, which means eating out and having a beer or glass of wine is amazing value. All the usual amenities are available including numerous restaurants serving almost every type of food you could wish for. Shops, supermarkets, chemist, Doctors and a weekly market are also available. A wide range of activities and sports can be found in and around the local area including snorkelling, fishing, paragliding and scooter & bicycle hire. Numerous Golf courses are also within easy reach by car. Gran Alacant has its very own Tourist Road Train to help you get around without a car. The tourist train makes 12 stops on a circular route around Gran Alacant. If you do not fancy hiring a car the tourist train will give you the opportunity to see Gran Alacant´s wonderful scenery, sea breeze and charm plus taking you to the shopping areas, places of interest and the beautiful Carabassi beach. Beach 1.7km with options to take a circular Bus, land train or a gentle 30 min walk. Bars, shops, restaurants & supermarkets a 5 minute walk away. Bus stop 5 minute walk away. Alicante or Santa Pola can both be reached easily by bus from the bus stop at the top of the road. Airport 8 minutes taxi ride away. Alicante is probably the coolest city you have never been to. Most tourists drive straight past on their way to beach resorts like Benidorm or Torrevieja. A beach side city, Alicante is located just 15 mins drive from Casa Sirocco. Stunningly beautiful with palm shaded esplanades where you can sip a Café con Leche and watch the world go by. Or stroll around the beautiful, vibrant marina, abundant with millionaire yachts before hitting the shopping streets, or the famous Fish Market where you will find all manner of seafood, fresh from the Mediterranean Sea. The World Health Organisation has voted Alicante as one of the healthiest areas in the world to live. The Costa Blanca has an excellent year round climate. The humidity is relatively low and being surrounded by mountains, the city is protected from northerly winds in Winter, giving the area more than 2800 hours of sunshine per year. We are 2 professionals based in the UK. Casa Sirocco is our holiday home in Spain, a place we look forward to escaping to. Like most people, we only have a set number of holidays we can take so rather than the house staying locked up, we would like to invite you to exclusive use of our Villa when we are not using it ourselves. We chose the house because of its contemporary style. Being able to walk out of the living area, down the steps and into the pool is wonderful on a hot day. The area has everything we need for a holiday. Great beaches, lively towns and cities, great walks / cycling routes and a host of restaurants to suit all tastes. The house is really easy to relax in. Just pop your bags away and help yourself to a coffee or a glass of wine or beer to settle in. Not a typical spanish villa. You won't find any pine furniture here! It is an open plan ECO house specifically designed for air to flow throughout keeping the house a nice temperature on hot days. The hot water system draws warm air in from outside, meaning that 75% of the cost of heating our water is free. The pool is maintained throughout the year so if you fancy a bracing January dip, go ahead! Air conditioning to all rooms. Inside airer and outside clothes line. Free and plentiful on street parking. No vehicles to be parked on the actual property. Fibre optic wifi is free to use. The passcode is in the welcome pack. A pod style coffee maker is available for use. A full range of crockery, utensils, saucepans, casserole dish, roasting tins, bottle and can openers etc are provided. A 50 inches flat screen HDTV is available for your use. Freesat UK / English is provided with all free UK channels. Spanish TV is also available through a digital aerial. Sonos Bluetooth speaker available for you to stream your own music. We encourage you leave and exchange books for the enjoyment of all our guests. Garden with planted borders, fully tiled for you to enjoy sunbathing and solar lighting for the evenings. A small balcony is located off the master bedroom. The other two bedrooms have Juliet balconies. An L shaped plunge pool with access steps is right outside on your private terrace. Note this is up to 2 metres deep and unfenced so not suitable for children under 8. Use at your own risk.